Do you have those similar experiences ? Great product. Good build and well made, not cheap plastic as some similar products. A must for travellers. Highly recommended. I am so excited about this. We have an upcoming out of country trip and this is so perfect and compact! Such nice quality and works great! 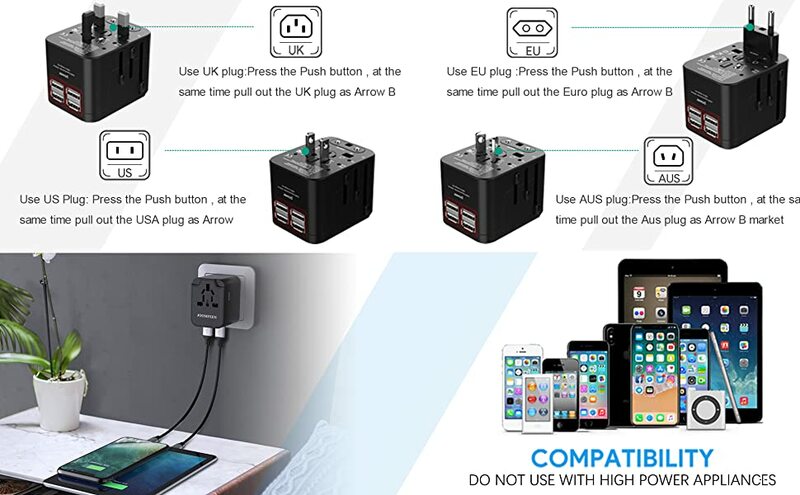 Small travel adapter supports all international input pins and all type adapters. Has 4 USB ports and supports upto 240v input. Built with nice plastic. Arrived on time!e. Product delivered is as advertised. I have not tried it on the road yet, but it works great at home. The 4 USB ports will simplify what components I need to bring with me. Overall, I am pleased with my purchase.This travel adapter works great on charging multiple devices. I am able to charge with the standard plug & usb at same time. It comes with a fancy leather carriying case. very nice. My wife and I travel overseas, specifically China, quite often for work and are always forgetting or losing our travel adapters. This one works perfectly! What I really like about it is that I am able to charge my laptop AND my iPhone and iPad at the same time. The design is quite clever. 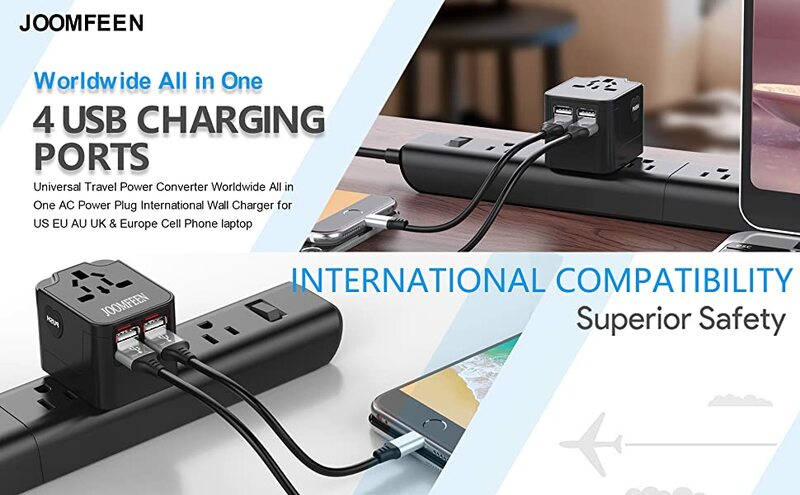 And with four ports for USB connections, charging multiple items at the same time is vital. Lastly, my wife really likes it because she can use her hair dryer and straightener when getting ready in the mornings. Kudos to a great product! Worked like I needed it to! Must have for international travel.<br /> I see a lot of people mixing up the word "converter" with items like this. This is not a converter, it's simply an "adapter" It's not converting 240 to 120, so be sure that you only use items rated for both 120/240 50/60hz and you won't have a problem. Cell phones, laptops, tablets, etc. are typically all dual voltage. I also purchased some standard plugs that gave my wife the ability to use her dual voltage flat iron and hair dryer while abroad. We spent two weeks in Europe and didn't need an expensive "converter" for anything.<br /> Travel safe!